The general public highly recognizes the Bernedoodle as a breed, but the American Kennel Club (AKC) does not. Some Bernedoodle breeders want recognition for their dogs, making this a controversial subject. Our concern with AKC registration is that kennel clubs strictly prohibits purebred dogs from ever mating outside their breed. This leads directly to inbreeding. As with any species, inbreeding results in a much higher risk of faulty genes passing to offspring. ​We govern our program by focusing on producing healthy and ethically raised dogs. After all, humans are responsible for inherently designing dog breeds through selective breeding. Cross breeding to achieve "hybrid vigor" is not a new conception. Many breeding programs from plants to livestock utilize this methodology. Introducing diversity into our curriculum and not rigidly follow a preset standard is of chief importance. We frequently inject our lines with European imports, therefore adding different traits and vigor into our breeding program. This is a primary ingredient in our recipe for healthy, calm, and beautiful hybrids! Breeders must be vigilant with hybrids as they can be carriers from both sides of their lineage and the panel testing eliminates those susceptible to disorders common to both breeds. We highly recommend you visit the Paw Prints Genetics website to learn more about the different testing they perform within their panels and encourage you to work with breeders who employ the same methodology within their practice. 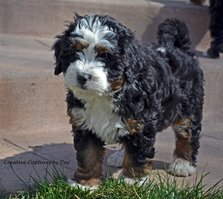 Rocky Mountain Bernedoodles represents dogs that we feel offer the best in health and temperament. We have a passion for each variety and guarded criteria to guarantee a happy and healthy family companion. The look of each puppy differs, however, our preference is unique, one-of-a-kind dogs. We breed for health and temperament over specific appearance, but we can typically guarantee an adorable outcome! A Newfypoo is a mix between a Newfoundland and a Poodle. Retaining the non-shedding and intellectual qualities of a poodle combined with the nurturing, "nanny" and rescue qualities of a Newfoundland. With a classic, non-shedding, hypoallergenic coat, they display a very calm, but playful nature and make great family companions. Frequent brushing and quarterly professional grooming is recommended. They exhibit a loving, loyal, alert and friendly demeanor. They are very intelligent as well as quick and agile for their size. For more information, please see our Newfypoo page. 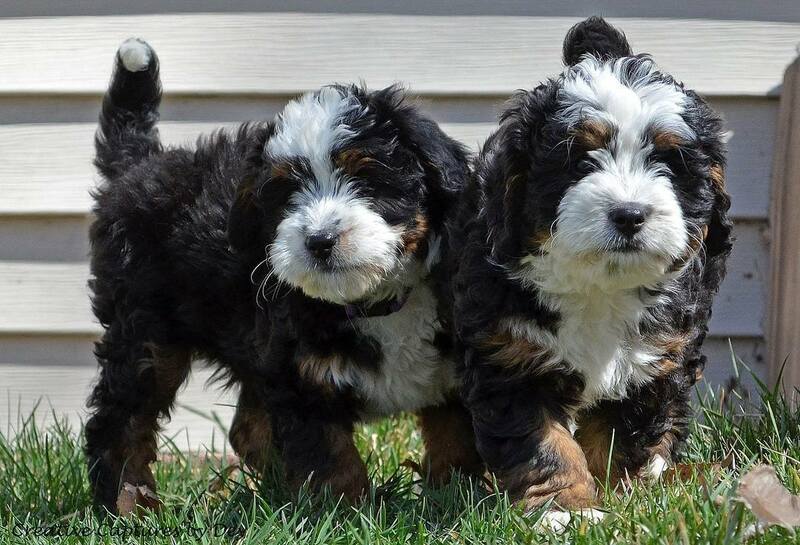 Rocky Mountain Bernedoodles has been making hearts pitter patter since 2003!